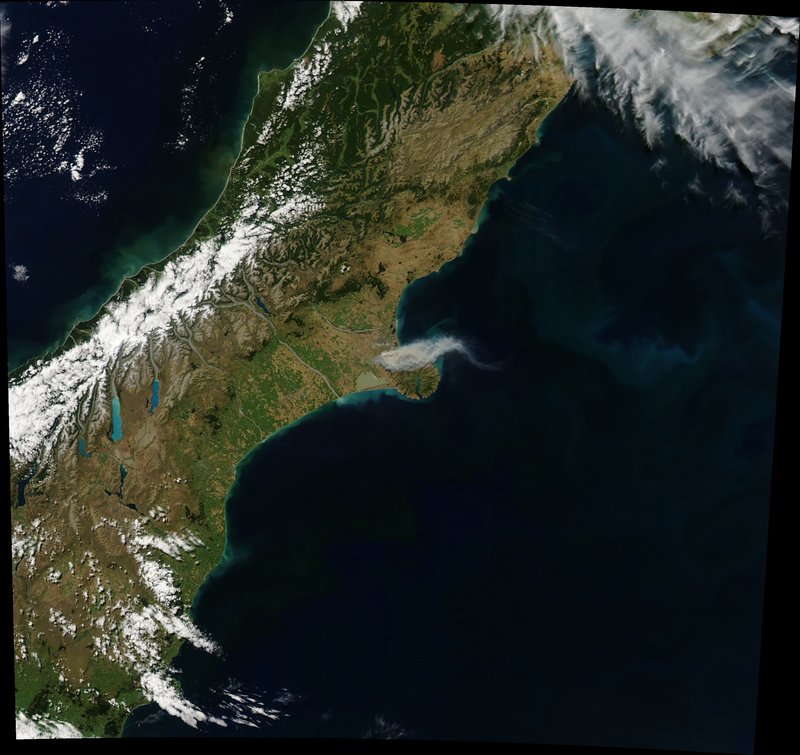 NASA Earth Observatory images by Joshua Stevens, using MODIS data from LANCE/EOSDIS Rapid Response and modified Copernicus Sentinel data (2017) processed by the European Space Agency. Caption by Kathryn Hansen. Fires near the center of Christchurch, New Zealand, have burned through homes and spurred the evacuation of more than 1,000 people, according to news reports. 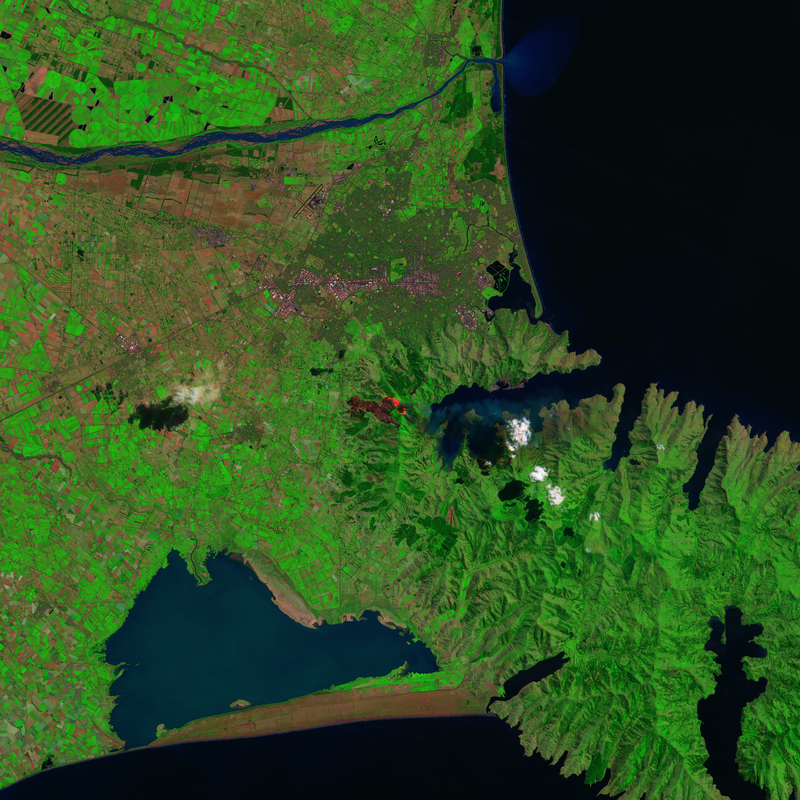 The seriousness of the Port Hills fires led officials to declare a state of emergency in the Selwyn District and in Christchurch, the largest city on New Zealand’s South Island. The Moderate Resolution Imaging Spectroradiometer (MODIS) on NASA’s Aqua satellite captured this natural-color image of smoke from the fires at 3:55 p.m. local time on February 16, 2017 (02:55 Universal Time on February 15). 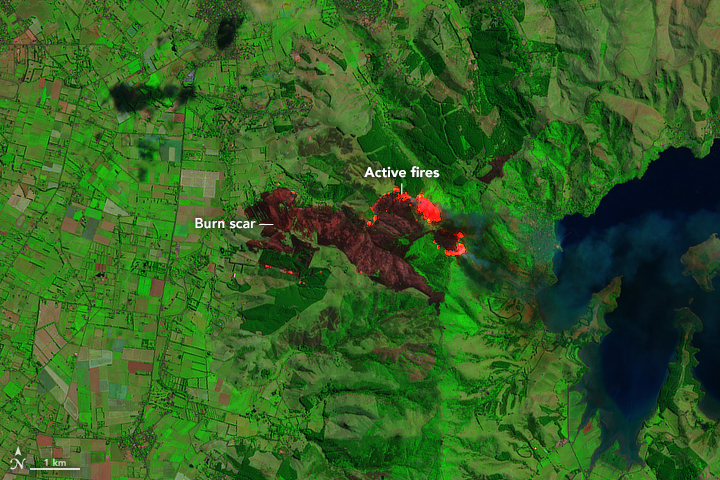 The two images below show more detailed views of the fire. 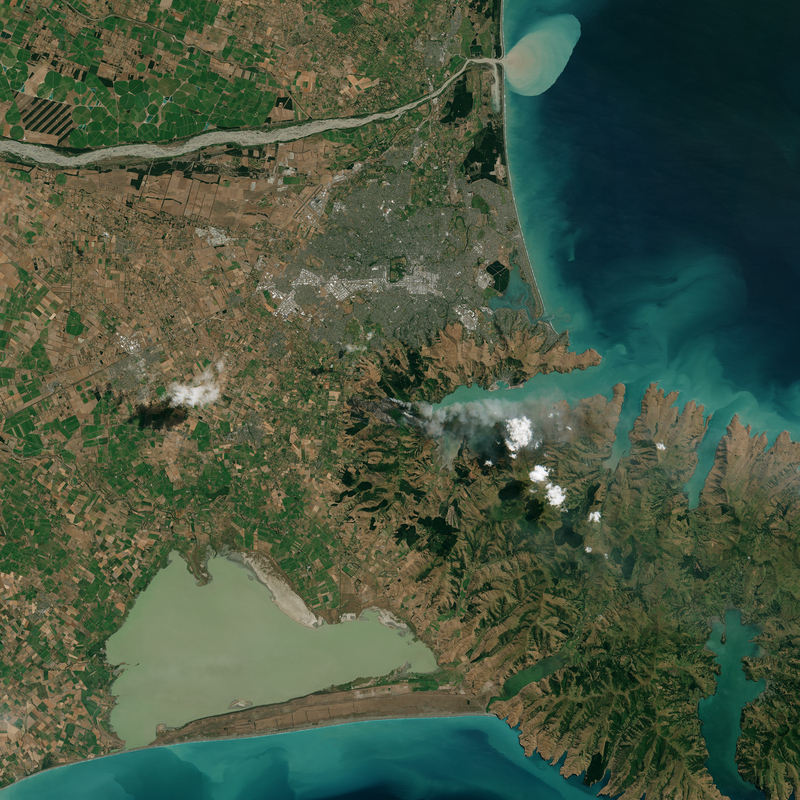 They were acquired by a multispectral imager on the European Space Agency’s Sentinel-2 satellite at 11:25 a.m. local time on February 14 (22:25 Universal Time on February 13). The first Sentinel image is natural-color (bands 4, 3, and 2) and shows smoke billowing toward the southeast. The second image is false-color (bands 12, 8A, and 4)—a combination of shortwave infrared, near-infrared, and red light. This band combination makes it easier to see actively burning areas (bright red) and burn scars (dark brown). 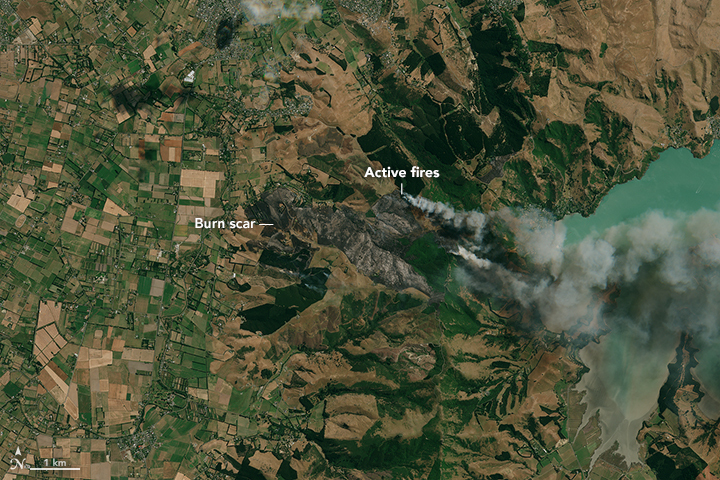 Christchurch Civil Defense Emergency Management reported on February 17 that the burned area spanned 2,075 hectares (8 square miles) and had a perimeter of 30 kilometers (19 miles). Light rain falling that day was expected to help firefighting efforts. Some areas were being reopened to the public as ground crews completed risk assessments. 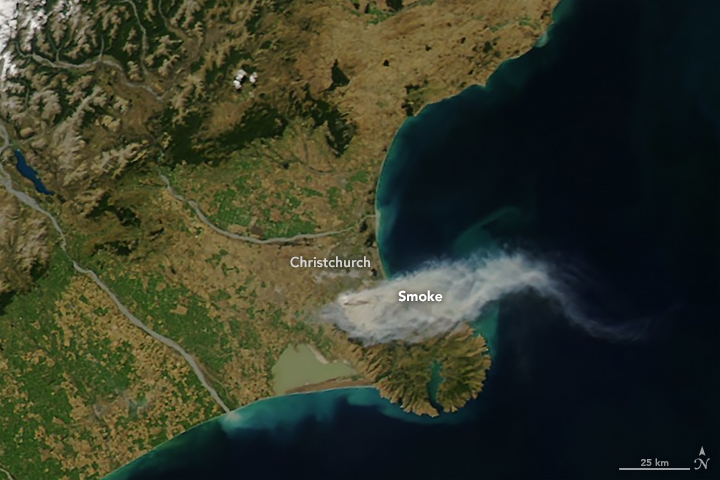 Australian Broadcasting Corporation (2017, February 16) Christchurch: More than 1,000 people evacuated as New Zealand bushfire rages into fourth day. Accessed February 16, 2017. Christchurch City Council (2017, February 16) Christchurch Port Hills fire - 11.30pm update. Accessed February 17, 2017. Christchurch City Council (2017, February 16) Christchurch Port Hills fire - 6.30am update. Accessed February 16, 2017. NOAA/NESDIS Regional and Mesoscale Meteorology Branch (2017, February 15) Himawari-8 loop. Accessed February 17, 2017.